Hard to believe, but my 2nd trimester is originating to a detailed. Ryan and I finished our hypnobirthing class on Monday, and then we discovered a sweet doula, Sarah York, across weekend. After much idea and debate and prayer, we’ve made a decision to offer birth at the hospital. Fortunately my OB is a family group buddy and life just three homes up from my moms and dads. Even more reassuring, she had natural births with four of her kids and it is worked up about my choice in order to prevent the maximum amount of health intervention as you can. Perhaps next time around, we’ll think about doing a property beginning or making the drive to Denver, but since there is such we don’t know about labor and distribution, I think the hospital will be the most useful atmosphere for Lucy’s arrival. However, I’m working on a birth program that is both particular and meaningful. We discussed beginning trauma within hypnobirthing course, and concept features directed my reasoning when I think about work and distribution. We quite often forget that children tend to be an equally crucial area of the birthing procedure. Their particular small, versatile figures work down through delivery channel, leaving behind the security and safety of womb. It is their particular lung area that have to take those first gasps of environment and their particular eyes that lock onto the faces of their moms. Even as we access the next trimester, I’m planning my own body and my soul for a peaceful and joyful beginning. One out of which Lucy seems no fear. Today naturally, so many different situations may appear and delivery rarely happens how we anticipate. But i know that my mind and my heart can take onto the promise of hope and comfort regardless of what turn my birthing usually takes. As I talked about last week, my desire for food has exploded IMMENSELY. I feel like I need to consume every two hours…and not just a granola bar…a hefty meal. Yesterday evening, I consumed an apple, peanut butter, an entire wheat bagel, two slices of mozzarella cheese and cinnamon raisin bread. All this consumed after the full supper of pasta and shrimp. She’s growing, I’m growing, therefore I’ll continue eating as much healthy and genuine food as my human body needs. Thankfully, i'ven’t had any cravings for dessert or cookies or ice-cream. 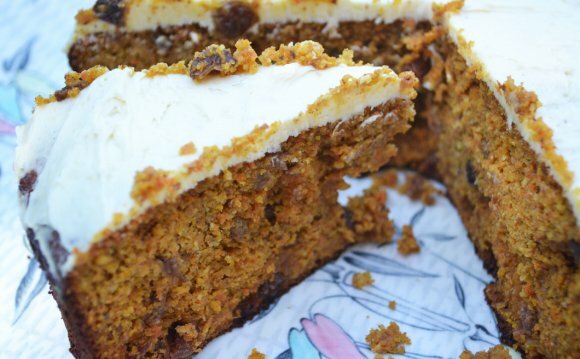 I have a tendency towards more savory food or treats which have been naturally sweetened, such as this Carrot Cake.